[The players of the Warren Commission farce of our day have taken their bow. The crew begins to strike the set, the actors are going home, and soon the house is cold and the stage empty. There will be no encores, and the reviews are not good. Behind the scenes, the director is relieved but a little nervous; the producers may or may not be satisfied with the return on their investment. So many pretty microphones, such fine suits and ties! But will it play in Peoria? "First of all, there's no scheme here or plot to spin this story to try to cover or take a bullet for anyone." It is extremely suspect that Eberhart was unable to comment when we look at his sworn testimony just moments before this question was posed to him on June 17, 2004, in response to Commissioner Roemer's line of questioning. Tim Roemer was the only Commissioner to pose a question about military exercises running on the morning of 9/11. He opened by making reference to an 8:38 FAA communication to NEADS regarding a hijacked aircraft headed to New York. The response from NEADS was, "Is this real world or an exercise?" FAA response was, "No, this is not an exercise, not a test." My question is, you were postured for an exercise against the former Soviet Union. Did that help or hurt? Did that help in terms of were more people prepared? Did you have more people ready? Were more fighters fueled with more fuel? Or did this hurt in terms of people thinking, "No, there's no possibility that this is real world; we're engaged in an exercise," and delay things? Sir, my belief is that it helped because of the manning, because of the focus, because the crews - they have to be airborne in 15 minutes and that morning, because of the exercise, they were airborne in six or eight minutes. And so I believe that focus helped. If the war games helped "because of the focus," why would General Eberhart be reluctant to go on record regarding the issue of just who was the central person coordinating that focus? Was the General himself, the man who headed NORAD that very morning, in charge of coordinating the multiple war games on 9/11? 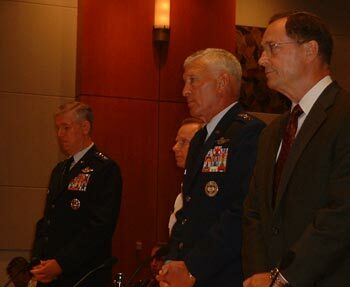 From the moment Generals Myers, Eberhart, and Arnold were sworn in to testify, they continually stated that NORAD's "military posture on 9/11, by law, by policy and in practice was focused on responding to external threats, threats originating outside of our borders" (a quotation from General Myers sworn testimony). But NORAD was not simply running "an exercise against the former Soviet Union" on 9/11, as Commissioner Roemer's question insinuated. That was only one of the multiple war games running that morning, titled NORTHERN VIGILANCE, which was simulating an air attack coming out of Russia. To insinuate, as Commissioner Roemer did, that this was the only exercise that morning lends credence to the three Generals' false claim that NORAD's only mission was to protect against external threats. The multiple war games running on 9/11 also included (but were not limited to) VIGILANT GUARDIAN, which involved hijacking scenarios over the continental United States. None of the war games was ever referenced by name at any time during the hearings. The details of these exercises are the Achilles' heel of the "external threat" mantra parroted by all three generals, and these details seem to be classified. There was one other mention of the war games from Commissioner Lehman, in which he referred to the military exercises as one of the "happy circumstances" on the morning of 9/11. In response to General Myers' statement regarding NORAD's legal mission, Commissioner Gorelick noted that it includes control of the airspace above the domestic U.S. (the Continental United States, or CONUS). She read the mandate aloud: "Providing surveillance & control of the airspace of Canada and the United States." Myers actually had the nerve to attempt to use Posse Comitatus as a rationale for absolving the Air Force of responsibility for what happened on 9/11. He claimed that the 1878 Posse Comitatus law (which has, ironically, been seriously undermined by the Patriot Act in the aftermath of 9/11) made it illegal for the military to be involved in "domestic law enforcement." Of course, it does. But that has nothing to do with 9/11, since hijack response had been a NORAD responsibility for decades; and for obvious reasons, nobody had ever raised a Posse Comitatus objection to that mandate in the past (because, for instance, the police do not fly F-16's). Commissioner BenVeniste asked General Richard Myers if he had been made aware of the arrest of Zacarias Moussaoui on August 17 as a suspected "suicide hijacker." Myers responded, "I think I would've but I don't recall." This is skillful deception, the kind to which BenVeniste has grown accustomed during his time on the 9/11 Commission. To pose such a question when it is a matter of public record that such drills were running on the morning of 9/11 is a patently misleading line of questioning. I can't answer the hypothetical. It's more - it's the way that we were directed to posture, looking outward. He reverted to the trusty (but absurd) mantra chanted by all three generals. While Commissioners BenVeniste and Gorelick appeared to be asking "hard-hitting" questions, they always stopped short of anything that would get to the heart of the matter. They made no mention of the war games running on the morning of 9/11, neither in this round of hearings nor during the previous round, in which Defense Secretary Donald Rumsfeld spoke under oath. Furthermore, not one of the Commissioners brought up the 67 Air Force interceptions successfully executed during the year prior to 9/11 (AP, 8/13/02). After the hearing Commissioner John Thompson was asked if there had been any discussion by the commissioners regarding the speed at which the fighter jets responded on 9/11. He said that there had not been, but that there would be. Such concerns were addressed very briefly during the commission's first hearings focusing on NORAD, back in May 2003, but nothing of importance was explored at that time. The Commissioners were asked about the war games - after the hearings. When Commissioner BenVeniste was asked why he chose not to ask questions about the war games running on 9/11 he claimed the time allotted was short and that he had done the best he could. When asked if he knew who was in charge of coordinating the multiple war games that morning he replied, "you'd have to check with staff on that." To this same crucial question Commissioner Gorelick replied, "…we did look at the exercises running on that day. I don't know the answer to that question." When asked why she chose not to question the generals about the war games she replied, "the staff concluded [that the war games] were not an inhibition to the military doing its job and therefore I wasn't going to waste my time with that." Apparently some members of the audience did not agree. "Tell us about the war games." These audience member comments were published in the Associated Press transcript of the hearings. At this point, tension filled the room. Shortly into the questioning, one of the audience members who had just bellowed at the commission stood up and shouted; "This is an outrage! My questions are not being answered, and I'm walking out!" He was carrying an American flag as he was escorted out. He must have realized the war games were not going to be addressed in any meaningful fashion. This outburst, though clearly audible, was omitted from the Associated Press transcript. It seems that this outburst may have been what prompted Commissioner Tim Roemer to throw the one & only softball question about the exercises at General Eberhart later in the hearings. It's regrettable that the protester didn't shout one or two of his questions before being escorted out, but his passionate gesture was helpful in its own way. Kyle Hence of 9/11 CitizensWatch asked Commissioner Gorelick why fighter jets weren't scrambled from Andrews Air Force base. Mr. Hence stated that, to his knowledge, at least 3 fighters from Andrews were performing exercises over 200 miles away on that morning. This left Washington DC defenseless on 9/11. When asked how that could possibly be allowed, Commissioner Gorelick would not comment. When asked if the commission had ever addressed the multiple war games running on 9/11, and who was in charge of coordinating them, Chairman Kean responded, "Yes, we did, it wasn't a coordination, there were a number of them going on as there are periodically but they were not, and they helped in one way because there were people available who wouldn't have been available otherwise." When following up for clarification on whether there was an individual in charge of coordinating these drills, Chairman Kean replied, "No, I don't think so. You might want to check with staff on that." Staff Communication director Jonathan Stull, after being asked the same line of questions repeatedly, has stated he is "looking into this." Mr. Stull later stated, "This is an issue that the Commission is looking into and will address in the final report." We shall see how far into this they look. The commission staff report presented new times for some critical events on 9/11. Based upon this new information, the military response time has been shortened and the FAA is left as the scapegoat. Least believable is the new time for FAA notification to the military that UA 93 was off course. Here are the new times for events on the morning of 9/11 compared to the original official times. One of the most shocking claims coming out of the final public hearing was what the Commission called the "phantom flight." This referred to the plane alleged to have struck the Pentagon. An FAA communication to NORAD stated it was Flight 11 - which had already struck WTC 1 - that was off-course and headed to Washington DC, not Flight 77. The report states it was "unable to identify the source of this mistaken FAA information." At 8:54, Flight 77 began deviating from its flight plan, first with a slight turn toward the south. It then "disappeared completely" at 8:56, according to the 9/11 Commission staff report. Shortly after 9:00, Indianapolis Center started notifying other agencies that American 77 was missing and had possibly crashed … At 9:09, they reported the loss of contact to the FAA regional center, which passed this information to FAA headquarters at 9:24 … Radar reconstructions performed after 9/11 reveal that FAA radar equipment tracked the flight from the moment its transponder was turned off at 8:56 a.m. But for eight minutes and thirteen seconds, between 8:56 a.m. and 9:05 a.m., this primary radar information on American 77 was not displayed to controllers at Indianapolis Center. The reasons are technical, arising from the way the software processed radar information, as well as from poor primary radar coverage where American 77 was flying. In sum, Indianapolis Center never saw Flight 77 turn around… American 77 traveled undetected for 36 minutes on a course heading due east for Washington, DC. "Okay … scramble Langley. Head them towards the Washington area." The order to scramble was given to fighters out of Langley Air Force base in Virginia, leaving the fighters scrambled from Otis over New York. However, the Langley fighters were headed east, not north, because they followed a "generic" scramble order. This sent them over the ocean, out of local airspace, because the lead pilot and local FAA controller incorrectly assumed the flight plan instruction to go east was newer guidance that superseded the original scramble order. Why didn't they follow the scramble order as issued from the Mission Crew Commander at NEADS? A direct order from a Commander most certainly supercedes any "generic" plan. It is claimed the Langley pilots were never briefed about the reason they were scrambled. As the lead pilot explained, "I reverted to the Russian threat… I'm thinking cruise missile threat from the sea. You know, you look down and see the Pentagon burning and I thought the bastards snuck one by us." Seeing how the Langley jets were scrambled out to sea, this "generic" scramble plan must have been assuming an external attack coming from across the Atlantic. But how is it conceivable that well after both Twin Towers are struck, fighter pilots were still thinking of a generic "Russian threat"? It is claimed the pilots were never made aware that the threat was from hijacked airliners. Wouldn't that information have been included in the NEADS scramble order at 9:23 or shortly thereafter? Two towers are burning and no one tells the fighter jocks? The Otis jets were scrambled at 8:46 in response to the hijacking of Flight 11. Because the plane's transponder signal had disappeared, NEADS spent the next several minutes searching their radar for the "elusive primary radar return." The Otis jets were airborne by 8:53, well after Flight 11 hit the World Trade Center. But were sent out off the coast of Long Island because, it is claimed, NEADS did not know where to send the alert fighter aircraft. This allowed Flight 175 to crash into the second World Trade Tower. This is almost exactly what happened to the jets scrambled from Langley, allowing the Pentagon to be struck. This information is all based on the commission staff report. Also under oath beside the three Generals sat Admiral Charles Leidig. Leidig was the stand-in Deputy Director for Operations of the National Military Command Center (NMCC) on 9/11 at precisely 0830. This ended up putting him in charge of facilitating the first conference call at the NMCC on 9/11 between multiple agencies including the FAA and NORAD. Throughout the morning there were difficulties getting the FAA into the conference call, which hampered communication flow for some time. Leidig said the FAA was "intermittently" in the call. He said he understood there were compatibility issues between their secure lines and the FAA's, which caused the FAA to "drop out" of the conference call. Admiral Leidig stated the NMCC was connected to the White House but not to Air Force One. Why not? "I do not recall." Investigative reporter Tom Flocco has provided a detailed analysis of the strange circumstances surrounding Admiral Leidig's assignment. He was asked by Brigadier General Montague Winfield on September 10th to stand a portion of his duty at 8:30 am on September 11th.